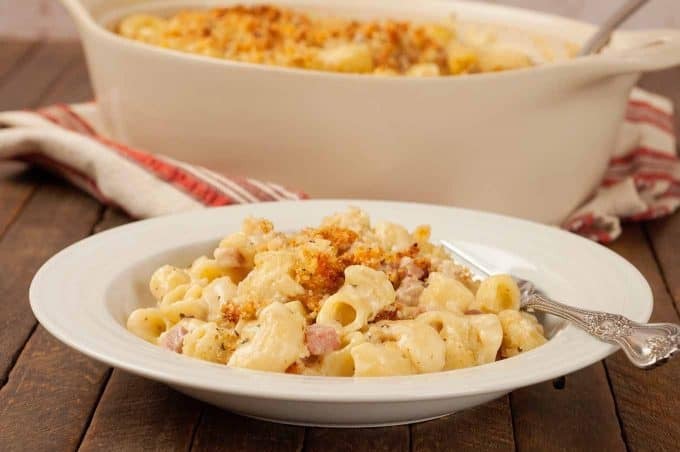 A creamy blend of sheep’s milk cheese from the French Pyrenees, chèvre (goat cheese), bits of tender ham and herbes de Provence lend this version of macaroni and cheese a unique and elegant flavor profile. 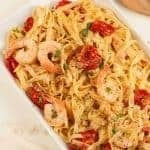 Serve it as a main course along with a salad tossed with a classic vinaigrette to make a deliciously simple family meal. 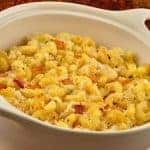 This uniquely flavored version of macaroni and cheese is made with a blend of sheep’s milk cheese from France, goat cheese, ham and herbes de Provence. To give this recipe an authentic French flair, we used imported cheeses, herbes de Provence and a delicious ham called HerbeCotto that we found at the deli counter of our local Whole Foods. It’s an all-natural, uncured ham flavored with a hint of herbes de Provence. 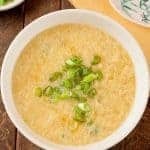 It worked beautifully in this recipe, but if you can’t find it, look for ham with a mild flavor like standard boiled ham. 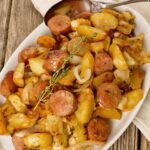 You don’t want to overpower this dish with smoky flavor or the sweetness you’d get from baked ham. Herbes de Provence is a dried blend of seasonings that are commonly used in southern France. The mix can vary slightly, but usually contains basil, rosemary, sage, thyme, fennel seed, lavender, marjoram and summer savory. It has a fragrant, floral quality and how much you use will depend on personal taste and the intensity of the blend you’re using. Ossau-Iraty is an ivory-colored sheep’s milk cheese made in the French Pyrenees. It has a firm creamy texture, buttery flavor and nutty aroma. 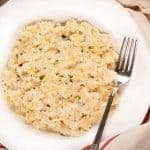 It’s high in butterfat, consequently, it melts very smoothly and is a good choice for macaroni and cheese. You can also use Pyrenees de Brebis, another sheep’s milk cheese produced in the same region as Ossau-Iraty. The flavor is similar and it also melts nicely. Chèvre is the French word for goat and when referring to cheese, describes a soft, creamy white cheese made with goat’s milk. It has a tangy, grassy flavor that blends beautifully with the sheep’s milk cheese in this recipe. Mimolette is a cow’s milk cheese produced in the city of Lille in the northernmost region of France. It is generally aged for 18 to 24 months and has a unique, bright orange color, fruity aroma and nutty, caramel flavor. 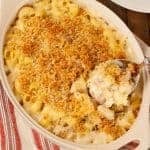 This looks soooo creamy and love the use of the tangy goat’s and sheep’s milk cheeses for a differently flavored mac n cheese. 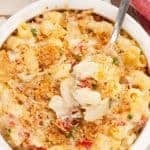 I’m such a sucker for any and all macaroni and cheese recipes. This one looks perfect! Can’t wait to try it! 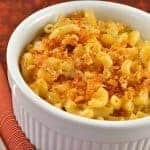 Macaroni and Cheese is always a fav in house! Such a wonderful comfort food dish. 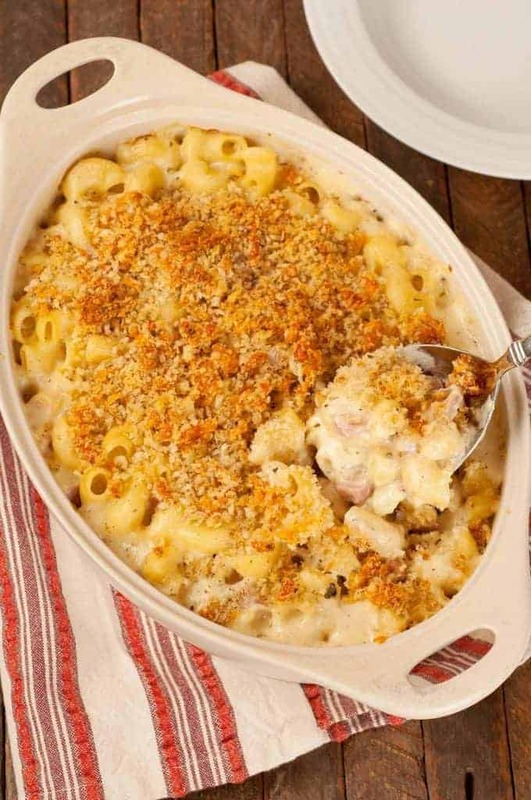 Your lovely mac and cheese would sure hit the spot—pure comfort food! I simply adore mac and cheese, especially fancy versions. Love all the different cheeses you put in this one! Thanks so much – the sheep’s milk cheese is particularly delicious! What a great dish! I love that you added ham to it. Happy Sunday!